High Pressure Boilers continues to be the leading resource for preparing for high pressure boiler operator and facility operating engineer licensing. 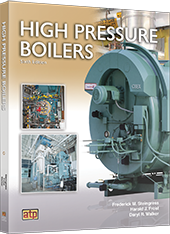 This textbook provides a comprehensive overview of the safe and efficient operation of high pressure steam boilers and related equipment. The latest combustion control technology, as well as EPA regulations and their implications, are covered in this edition. Each chapter includes case studies to enhance learning as well as a separate chapter with test-taking tips and six sample exams.